After resolving recent water damage caused by winter storms, we decided to replace the remaining carpet with hardwood floor.c Even though damage to the carpet isn't visibly obvious, many spots are pee-stain by our puppy in his younger day. We knew we wanted real wood, and not laminate or tile (wood look) flooring. Overall, it took approximately 3-4 weeks of time to research the right hardwood flooring. This is followed by another 2 weeks to select a contractor to pickup/deliver and install the hardwood floor. Between pickup/delivery and installation, we waited another 2 weeks to allow the wood to acclimate. Overall, other than some squeaks and creaks in the boards, we're fairly happy with the installation. An upside is that hardwood floor can be refinished when necessary. That being said, it was our first time doing hardwood installs and there are always lessons to be learned. Carpet vs Wood Flooring: One of the main reasons for switching from carpet to hardwood is ease of cleaning. Since moving into our home, the carpet was in fairly good condition. The problem is whenever our puppy had an accident on the carpet, even with pet vacuum cleaners and sprays, this eventually left behind a minor smell. Hardwood is easier to completely clean. And, wood is easier to wipe up all the dust as compared to carpet which may lock in more dirt and dust. 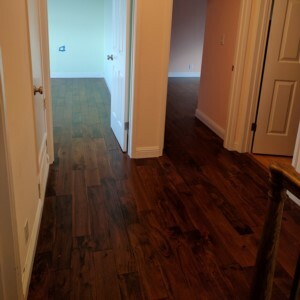 Laminate vs Hardwood: Having lived in a previous townhome installed with laminate, it has a very nice look of wood, but the feel is different. Despite the higher prices for engineered hardwood and hardwood, we figured it would be a better option. We felt that hardwood would have more of an impact on the value of our home in the long run as well. With a well cared for hardwood, that can be refinished and stained multiple times, we figured it was a worthwhile investment. Engineered Hardwood vs Solid Wood: After settling on hardwood, we found there was a distinct difference between engineered hardwood and hardwood. Both have a layer of real solid wood on top (the surface where you step on), but engineered hardwood has other wood on the bottom. This is ideal for bottom floors or floors with concrete. Neither was one of our conditions, and the price for full hardwood was only $0.50 per sq/ft more than engineered hardwood, so we went with the full hardwood floor. There are other considerations to pay attention to and this is good cheat sheet resource. Big Box Store vs Hardwood Flooring Store: Lowes and Home Depot have a wide selection of flooring. Unfortunately, most of it is laminate or lower priced engineered hardwood. They do have some hardwood, but most of that is available only by special order and it's difficult to see and feel the options. Compared to the highly Yelp rated Asian (English speaking) hardwood store which have good options. We ended up purchasing with GEW Hardwood Flooring. There are other options like Lumber Liquidators, but we chose not to visit due to all the negative press and less than stellar reviews across nearby stores. Purchasing Hardwood Flooring: We ended up going with a Acacia wood at around $4.50 a sq/ft. Our project was approximately 700 sq/ft, and we were told to purchase about 15% more than we need for excess cutting. This amount may depend on the contractor, as it depends how much wood is wasted. Other things: You may be responsible for purchasing is the padding under the hardwood and T-Moulding and Threshold Mouldings. We ended up purchasing these at Lowes, but the price for these are fairly expensive for what you get. T-Moulding is about $50 to cover 2 doors. The padding was about $50 per roll, and we needed about 8 rolls. Just other costs to keep in mind. DIY Project vs Hardwood Floor Contractor: Since I've had experience installing baseboards, I figured installing hardwood flooring wouldn't be too difficult. The upside is that I already have a miter saw and air compressor nail gun. However, because the material as $4000-$5000, I decided to go with a professional with experience. If I were doing a smaller area or the material were less expensive, I'd consider completing as a DIY project. Job Considerations: Overall, the installation prices and quotes were mostly inline. Most contractors offered a price per sq/ft. However, after putting the cost of the baseboards back in, they charge an additional fee. The contractor we ended up going with at once listened to everything we needed and offered the lowest bid that included everything we asked for. Additionally, they offered to complete the project over one weekend, which is more convenient for me, since I'm at work during the weekdays. Hardwood Floor Contractor Search: I spoke to some contractors we've used in the past along with posting a few a request for quotes on Thumbtack.com. I got many bids, but most of them still want me to contact them in their system, which defeats the purpose of thumbtack. I considered bids that were able to provide a quote without having to re-explain my situation over the phone with them. Timeliness: On the first day, the crew arrived a couple of hours later than the 7am start time they requested. But his team put in a solid day and achieved good progress. The entire project took about 2 full days of work. Existing Carpet Removal: All the carpet and padding was quickly removed. Everything was hauled away after the first day, so there was no mess. The miter saw was operated outside, so it cut down on the amount of wood dust inside the house. There were some trimming along the wood panels which created some wood dust, but that was quickly cleaned up. Noise: Since we wanted to stick around in case there were any questions (which there weren't many), we decided to stay downstairs while the team worked upstairs. It was much noisier than I was expecting. Not unbearable, but we decided to spend some of the time outside. The noise of the compressed air nail gun constantly going off was reassurance that the boards were being securely fastened to the floor. Sound: Something to get used to is how the sound echoes a lot more. This was more noticeable when all our furniture was still tucked away. It got better (or we got more accustomed to it) after more of our furniture got moved in. The downside is there is still some creaking happening as we walk along some of the boards. When asking the installers, they said it was because the settling of the home caused the floor to be uneven. Feel: The touch of the hardwood compared to carpet is also going to be much smoother. We didn't consider this for our situation because we didn't feel it would be an issue, but our 15 lb maltipoo now slips and slides and can't take turns as quickly as before. What can be done to prevent squeaking? Possibly more expensive, but better padding? Make sure the corner each piece of wood doesn't get too close to each other. I'd rather purchase more wood, as 4 corners touching don't look very good. What steps do you take to reduce damaging the wood you've already installed?